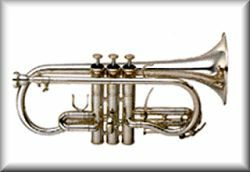 The CORNET is a close relative of the trumpet. The standard cornet in brass bands is the Bb cornet. The instrument’s pitch range is the same as that of the trumpet. The cornet is the most numerous instrument in the brass band, with about a third of the players playing cornets. A full brass band also includes the soprano cornet, a smaller version of the instrument, which is pitched in Eb. The cornet is the smallest instrument used in the brass band. The main tube has a conical bore, gradually tapering from the leadpipe to the bell. Virtually all cornets have three valves of the piston type. The instrument is equipped with rings or levers on the third and (sometimes) on the first valve slide. These are used to compensate for intonation problems that are inherent in any brass instrument design. When played, the cornet is held straight out from the lips, with the valves vertical or slightly inclined to the player’s right. The right hand is used to manipulate the valves, and the left hand supports the instrument. If the cornet is equipped with compensation mechanisms, they are usually operated with the left hand. The tone of the cornet is midway in color between the bright sound of a trumpet and the dark, complex tone of the flügelhorn. The relatively short air column gives the cornet agility and responsiveness. Brass arrangers and composers sometimes modify the sound quality of the cornet by specifying various kinds of mutes. The straight mute and cup mute are the most common. More subtle changes in timbre can be achieved by writing in high or low registers, varying the key, instructing the player to play with the bell close to the stand, use of dynamics, or the presence or absence of vibrato. In a brass band, the cornet supplies the principal soprano voice. This instrument occupies a position in the band similar to that of the violin in a symphony orchestra. In small groups, the cornet is almost always the principal melody instrument. However, even in small groups (such as a sextet), there are usually at least two cornet parts, with the second part supplying the alto voice. In more complex arrangements, the cornet section is sometimes split into three or four parts. The parts are often subdivided as divisi into two, three or more voices. Because the cornet is the highest-pitched instrument in the brass band, and because its tone is relatively bright, it is capable of “cutting through” and being heard even when the entire band is playing. The agility and speed which can be achieved by a skilled cornet player also make it a favored instrument for solo items, both with and without full band accompaniment. Because of its small size and relatively low cost, the cornet is the instrument most often used for beginner instruction. Although the length of the main tube is the same on both the cornet and the trumpet, the arrangement of the tubing is different. The trumpet’s tube is straighter, with fewer curves and loops. This makes the instrument longer in terms of the actual distance between the player’s lips and the flare of the bell. Not only does the cornet have a more complex tubing design, but the tube itself is more tapered, with a conical bore instead of a cylindrical bore for the bulk of its length. Although the diameter of the bell at the extreme end of the flare is generally similar (this varies depending on the manufacturer and model), the cornet’s flare is more gradual. Both the tubing complexity and the degree of slope of the bore influence the final sound of the instrument. When viewed with an oscilloscope or a similar device, a trumpet tone is clearer (closer to a pure sine curve) than that of a cornet. The trumpet sound is also easier to “overblow”, when the sound is distorted into a harsh blast. A cornet, because the sound is more complex and “fuzzy”, is less easy to overblow (although it is still possible). The cornet’s sound is more gentle and warm than that of the trumpet. Trumpet players rarely employ vibrato, while that technique is frequently employed by cornetists. Larger bands usually include an Eb soprano cornet. This instrument is pitched a perfect fourth higher than the Bb cornet. It is brighter in sound than the “regular” cornet, and can be easily heard above the full band tutti. Some players use piccolo trumpets instead of the soprano cornet. This variant of the common cornet is considered a difficult instrument to play, in part because of the exposed nature of the parts. There is almost always only one soprano cornet in a band, and soprano players are considered specialists. Although it possess the same agile qualities as the Bb cornet, and is generally played by a skilled person, the soprano is rarely featured as a solo instrument.